Charis sleeps over . . .
One of the funnest things in the world to do is to sleep over at Grandpa and Grammy’s house. 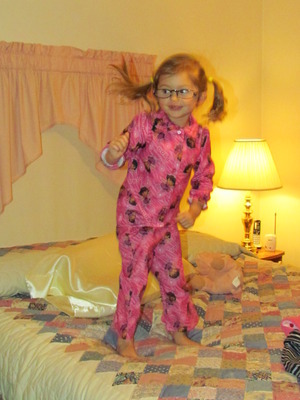 Grammy lets me wear her nighttime reading glasses and jump on the bed! and it is fun, fun, fun!!! Precious times spent with this precious kidlet! My goodness, how she’s grown! What fun y’all must have. I can’t wait until my grandbabies move back so we can have sleepovers!